‘Me with Burrito’ should be a tag used more often. I wish I was closer, I love tacos…and you guys! Hi Paul, it was great finally meeting you and Darlene! Love your books – almost done with the first one! Thank you for doing your ‘manly’ pose for my camera and listening to me rant and rave about stuff. A very “nice” first impression, I’m sure. Security! Looks like fun. I wish I could have been there. Let’s do this EVERY weekend! I wish I could’ve made it! Where can I get your books? (southern CA/L.A. area)?? I saw that Tabe BBQ showed up for the signing. I love their food, and now I’m checking out Cool Jerk. You must be pretty good for Tabe to spend some time there, and I spent a while reading your comics. I love it! Funny stuff! Me again. I’ve been picking away at your archived comics, and now I think I need to buy a book or two! What do you know about Speedy DNS? I think they’re a bunch of dickholes. They’ve been spamming my site. How about you? @JustJENN: I’ll see if I can add “me with burrito” and “poop closet” to my Tags! @caninecologne: I’m happy you like Hodabeast! The signing was all the more successful and worthwhile in having met you in person. @TABE FAN: You’re too kind. I’m going to get my books into M-Theory on consignment. SOON! Meanwhile — eat at Tabe BBQ! @Susbro & Dianna: Missed you, too! 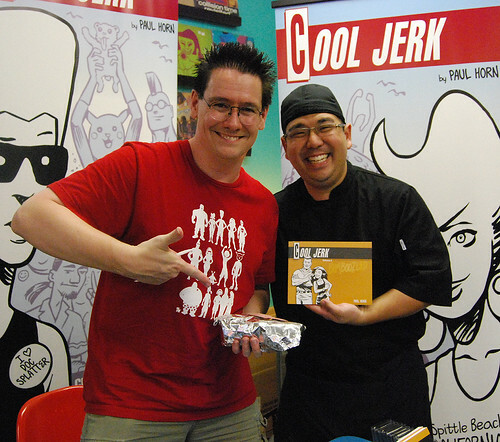 You can get ALL Cool Jerk books at Meltdown (L.A.), Comics, Toons & Toys (Tustin), and House of Secrets (Burbank). Or from me! @Steverino: I’ve been getting hit by those douchenozzles, too. I don’t want to know what “poop closet” is in reference to.